Why are we crazy about it? If you ever see this car, you will also be crazy about it!! It certainly stands out among a crowd of antique or modified cars!! It was found in a garage in Seely Lake , Montana in the year 2000. It was all original with a few dents, but absolutely no rust. It underwent a nearly 2 year restoration and a lot of changes from factory specifications were made ie., the engine is a 1973 Oldsmobile 455 and has many Joe Mandello pieces-pistons, rods, cam, etc. Other changes include: a Turbo 400 transmission, Dodge Diplomat front end, differential is a Dodge 8 1/2 inch 2:73 posi gear. Rear springs are Mustang 2 with extra main leaf, radiator is a Walker Super Cool with an electric double bladed fan. It has a tilt steering wheel out of a 1980’s Jeep, bucket seats out of a 1990 Oldsmobile on 6 way power seat bases from a Chrysler. The rear seat is stock. In order to insure good brakes, a Corvette master cylinder was included. It features a custom hood ornament made in Missoula, MT., custom window and door knobs made in Helena, Mt. and a custom dash, [it does retain the original glove box]and it has a 16 gallon gas tank. It has custom running boards and custom paint. 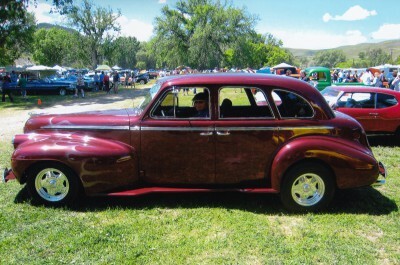 The paint job was done in dark garnet red with ghost flames by Marvin Jobe in Missoula, Mt. We are members of the Shifters Car Club, Lolo, Montana and enjoy being with our friends in the club. If you are interested in joining our club, please call Gary at 1-406-369-0505 and he will fill you in on how to join us. If you are interested in joining a national car club, you will find the websites of major car clubs on this site. Just scroll down on the right side of the screen to find the one you might be looking for to join.